In recent years Live on Stage Entertainment Pvt. 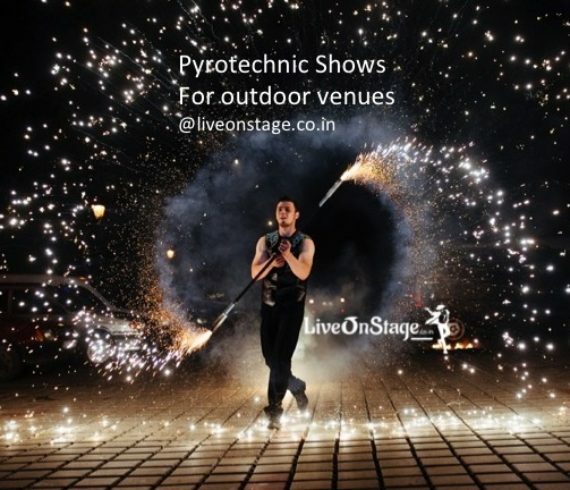 Ltd. from theatre stages to outdoor arenas, have produced fire shows in partnership with the WORLD’S BEST FIRE DANCERS, combining Pyrotechnics, Drummers, Acrobats, Aerialists, Stilt and UV performers. We have worked with international renowned performance artists to produce some of our most original shows. Large scale pyro-narratives have been created for corporate events and Opening & Closing ceremonies of Sporting events. Stilt, crane and tower performers add an essential human element to the abstract world of fireworks. A collaborative design project with the World’s best fire, led, Laser performers have seen a new generation of shows captivate audiences in India.